Super Bowl XLV Black Eyed Peas Halftime Show Illuminated with Creative Lighting Solutions LED Strip Lights! Creative Lighting Solutions (www.CreativeLightings.com) lights up the night at Super Bowl XLV. Creative Lighting Solutions provided the custom LED strip lighting, custom controllers and LED lighting products for Super Bowl XLV dancers' costumes. With a very short time frame, Creative Lighting Solutions pulled off custom configurations and control systems for the live TV Black Eyed Peas Super Bowl Half Time show. Two of the members of the group also wore LEDs and custom control DMX units during the performance. 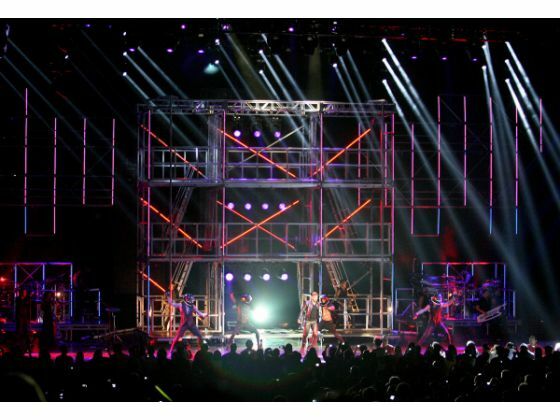 Taboo's costume and Apl.de.ap's costumes employed over 500 individual LEDs. Creative Lighting would also like to give credit and thanks for all the hard work of the costume manufactures; Just for Kix; our engineering partner; Engineering Solutions and the production company; ShowFX that made a concept a reality. Video Screen surrounds are lit with Creative Lighting Solutions LED Strip lighting.